Now to choose your base flavour - you can have a vanilla sponge base, a chocolate sponge base or mix things up and have half vanilla and half chocolate - the best of both worlds! Get Jammin' - do you like jam in your cake? Now is the time to decide. You can choose between three flavours of jam - strawberry, raspberry or apricot - or none at all. Now for the best bit - the fillings and toppings. 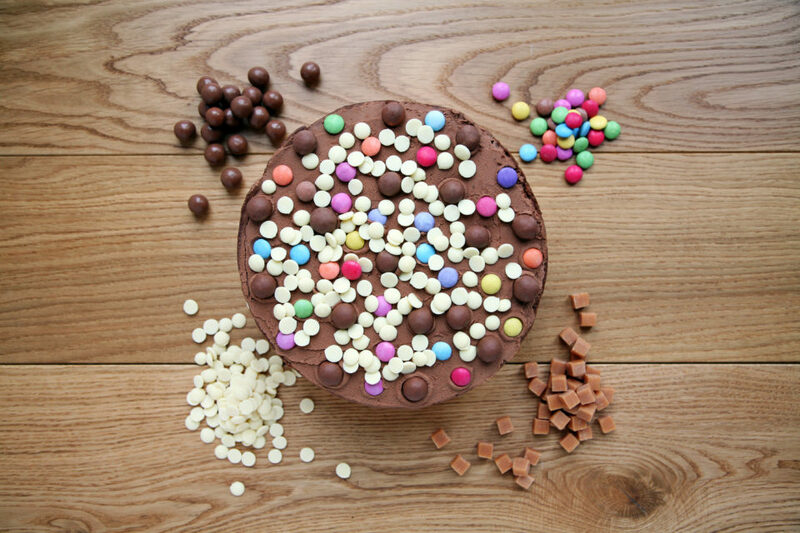 We have fourteen different fillings you can add to your cake - smarties, maltesers, milk or white chocolate chunks, marshmallows, coconut, fudge pieces, oreo biscuits, mini eggs, jellybeans, milk chocolate or white chocolate crispy pearls, bounty pieces or snickers pieces. For toppings we have even more choice with eighteen options - hundreds & thousands, milk or white chocolate shavings, double chocolate drizzle, smarties, maltesers, milk or white chocolate chunks, marshmallows, coconut, fudge pieces, oreo biscuits, mini eggs, jellybeans, milk chocolate or white chocolate crispy pearls, bounty pieces or snickers pieces. So whether you would like to create your own version of a toffee fudge cake or perhaps a take on a snickers cake - the choice is up to you! Do you have your kids birthday coming up? Why not let them create their own birthday cake. It can be lots of fun and they can come up with whatever creation they like - let them get wacky! We love seeing some of the creations that go out. Make sure to send us pictures of your create your own cake creations and you could be in with a chance of winning our monthly Sponge Moment competition! The best sponge moment photo we receive will win a Super Sharing Sponge Cake - 14 different flavours in one cake! Send your Sponge Moments to us by email, Twitter, Facebook or Instagram and you could be in with a chance of winning!